A science team that includes researchers from Scripps Institution of Oceanography at UC San Diego has linked increasing oxygen levels and the rise and evolution of carnivores (meat eaters) as the force behind a broad explosion of animal species and body structures millions of years ago. 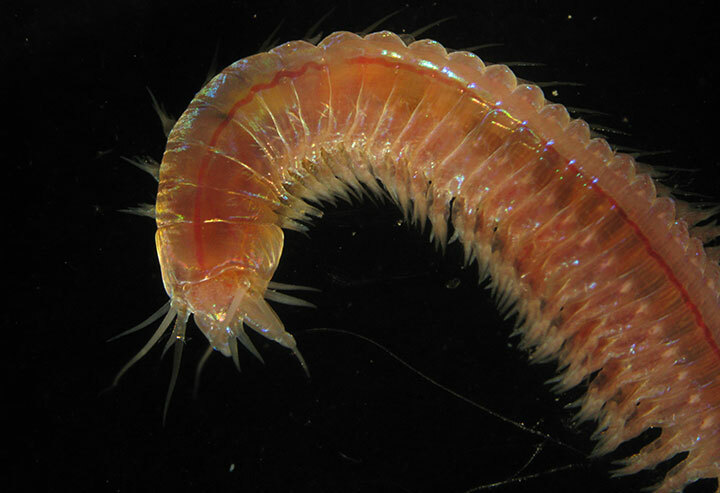 Led by Erik Sperling of Harvard University, the scientists analyzed how low oxygen zones in modern oceans limit the abundance and types of carnivores to help lead them to the cause of the “Cambrian radiation,” a historic proliferation of animals 500-540 million years ago that resulted in the animal diversity seen today. The study is published in the July 29 early online edition of the Proceedings of the National Academy of Sciences. 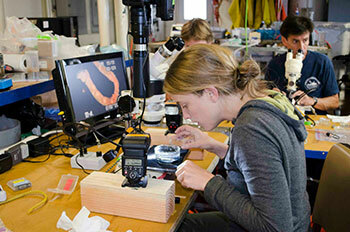 Christina Frieder takes images of live polychaetes (marine worms) while at sea. Lisa Levin, a professor of biological oceanography at Scripps, along with graduate student researcher Christina Frieder, contributed to the study by providing expertise on the fauna of the ocean’s low-oxygen zones, areas that have been increasing in recent decades due to a variety of factors. While the Cambrian radiation exploded with new species and diversification, Levin believes this study suggests the reverse may ensue as oxygen declines and oxygen minimum zones expand. As part of the research study, Sperling spent time at Scripps working with Levin and Frieder. He also participated in the San Diego Coastal Expedition (bit.ly/sdcoastex), a cruise led by Frieder aboard the Scripps/U.S. Navy research vessel Melville and funded by the UC Ship Funds program, which offers students unique access to at-sea training and research. In addition to Sperling, Frieder, and Levin, coauthors of the paper include Akkur Raman of Andhra University (India) and Peter Girguis and Andrew Knoll of Harvard. Funding for the study was provided by Ministry of Earth Sciences, New Delhi, Agouron Geobiology, the National Science Foundation, and NASA.